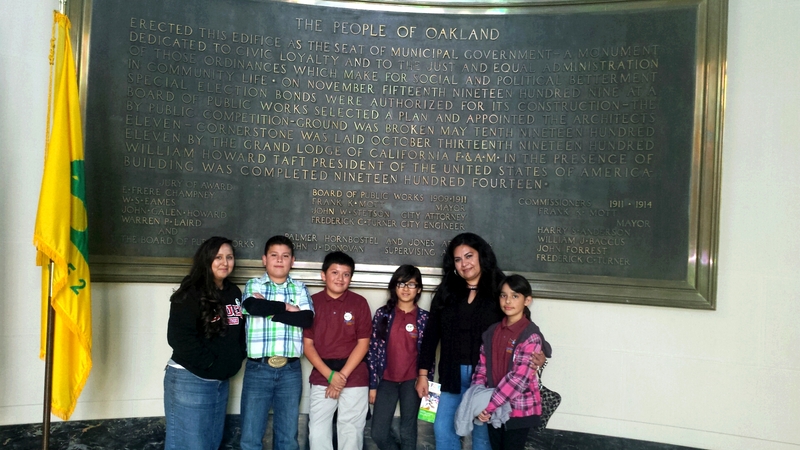 "Congratulations to the four 5th grade students of Esperanza Academy that attended the Oakland Youth Input Forum in downtown Oakland City Hall on March 11, 2015. This was an excellent event and a great experience. We are so proud to have been part of it. 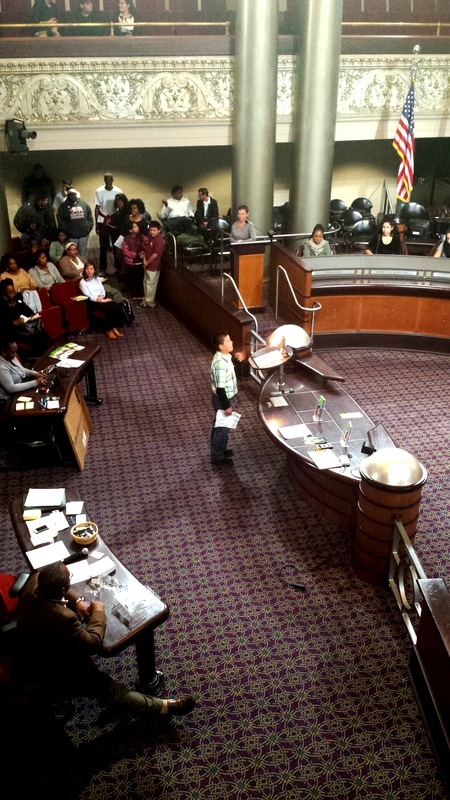 The students had an opportunity to learn and obtain new skills such as public speaking and leadership. Being in that room with many other young people took Ms. Elizama and I back in time to our high school years. Both Elizama Rodriguez, our 5th grade Line Staff, and I attended Street Academy High School in Oakland where we were lucky enough to have attended these same kinds of events. 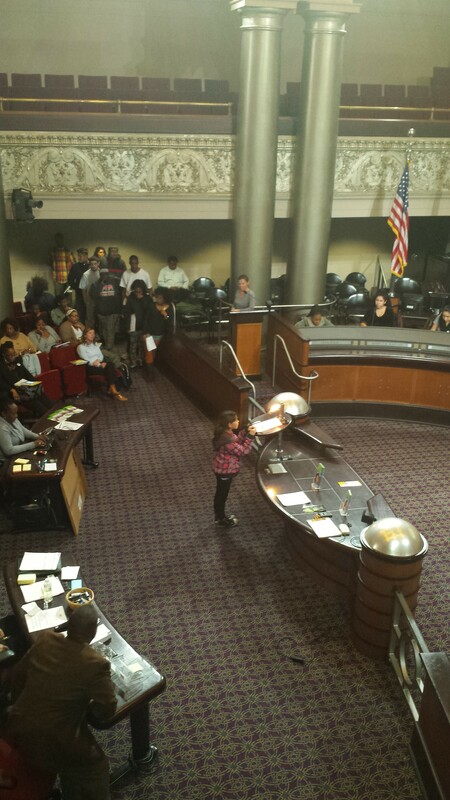 We agreed that it helped us so much when growing up in Oakland, to be able to exercise our freedom of expression. I am glad we had the opportunity to provide our students with similar experiences because I know that it can make a difference. This was a new experience for our students who expressed to me how this amazing opportunity made them feel important. We are proud of Susana Cornejo, Jorge Gonzalez, Alberto Sanchez, and Emily Villa." "When asked, families often say they wish they knew more about what happens when their children are in school and may wish they were more involved. School teachers, directors, and administrators often say they wish families were more involved in their children’s learning and education. Everyone seems to want something more from each other. But WHAT DOES "BEING INVOLVED," MEAN? And does it matter? Being Involved is family engagement. FAMILY ENGAGEMENT is described as meaningful communication between a school and the families of the children attending the school. Our Family STEM night was a successful family engagement event because it included a commitment from both families and the school. Our families are committed to supporting their child’s learning. The school is committed to involving the family in their child’s learning experiences." "In the past, family engagement focused on the parents or guardians. Many different family members HELP CHILDREN GROW AND LEARN. So successful family engagement includes not only parents but also other people in the family—sisters, brothers, grandparents, aunts and uncles. Also, in the past, family engagement was clear and simple. Involved families made sure their children went to school and got there on time. They helped with homework, attended parent-teacher conferences and volunteered for special activities such as planning a party, going on field trips or raising money. While all of these are important things, most people now believe that effective family engagement is more complicated." "Our Family Science Night focused on families coming together and spending quality time doing fun and engaging activities. With everyone being so busy these days, it leaves little time for families to do arts and craft activities together. At Family Science Night the Howard Elementary School After School Program supplied everything that families needed to do these types of activities. In the pictures above you will see happy students partnering with their parent's side by side to complete tasks. Activities like these strengthen relationships, and allow for families to have conversations about what they like doing, and showcase the schools' effort to UNITE FAMILIES AND ALLOW THEM TO BE APART OF THE LEARNING PROCESS." "This week in After School Programs at Oakland Tech. We would like to showcase the following two programs: the Tech Techies and Techbridge Girls.Tech Techies is a set design building program. This after school program supports our performing arts day classes. Oakland Tech has been known for having a strong performing arts program in theatre and dance courses. Tech Techies builds all the props and design the sets for the stage. Tech Techies are also responsible for controlling the lights and sounds for all our school events. The above picture shows program instructor Casey Fern giving today's task for building a stage set." "Also included is Techbridge Girls program. This program is dedicated to science and engineering at Oakland Tech. This program is design to get more females students interested into the careers of science and engineering. The program was once a part of Cabot Space and Science center. Now it's a part of our after school program. The girls are given science projects each time they meet." In order to showcase the BACR After School Program at Bunche Academy we have decided to share a video created by its very own students. The students who created this video belong to the Bunche Academy audio technology and photojournalism class. The photos were taken by Marleni Sanchez, Dominique Hartwell, and Marcus Williams. The the music was composed by Thomas Robinson and Silas Wilson.